TITLE: Episode 20: Making friends and meeting people and focusing on YOU detoxing your beauty cabinet and trying a new activity essential for expats. 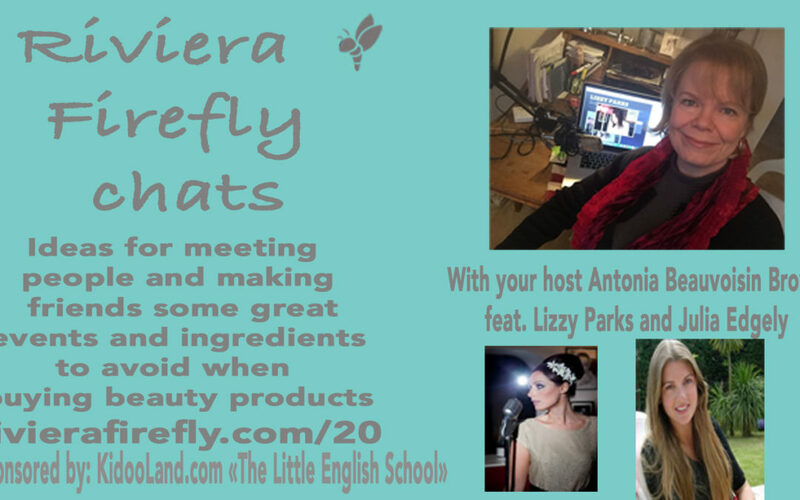 Welcome to the Riviera Firefly I can’t believe we made it to this far .. this podcast started as an experiment really well more of a challenge by my business coach the amazing Nathalie Ekdahl from the Bizchix podcast..It has been a fun fun journey . I can’t tell you how wonderful it has been getting to chat with those amazing female entrepreneurs and 2 cool dudes on their life journey and I have also loved finding some useful business tips and solutions for you to implement in the hope you can streamline things and work less and play more. It hasn’t been without its challenges .. technical and epic fails .. interviews that go pete tong and it’s a times like that ..that a message like this one touches me deeply? So I received a really heart warming message from a listener the other day unprompted and unsolicited by me I hasten to add .. she wrote You are providing us with so much info that after 14 years here as an anglo we have never had this! Bravo to you!!! Work – Life – You balance needs to be in check .. do some R&R e.g. Groupon.fr for some vouchers.